Two adjoining shops with scratch-built internal decoration. In the quiet village of Augusta, where Masons Alley crosses Main Street, you will find two shops. The first, Number 11, is "Burke and Hare's Funeral Services", which handles all of the undertaking business for the surrounding area. The corpses are lain in coffins for friends and family to view, before being taken to the appropriate clerics for the final ritual - be it burial or cremation. Next door, at Number 13, you will find an unusual boutique. Known as "Ye Body Shoppe", it supplies rare and bizarre items for arcane alchemical recipes, together with some of the more unusual components used in the dark art of necromancy. All the local folk have adopted the somewhat superstitious practice of offering up prayers to the departed as they pass by, leading to the spot being named "Amen Corner". A view of the two shop fronts from across the street. The front right view of the shop fronts. The rear of the two shops, showing a few broken tiles on the roof. "Welcome sir. Do come in. How may one be of service? Oh! I see, sir. Would you prefer this mahogany casket, or the pine one outside, sir?" "What's behind the black curtain, sir? You wouldn't be interested, sir, it's just where the bodies are prepared. Gets a little smelly in there at times, sir." Note the back door leading to the 'storeroom' between the two buildings. "Welcome mathter", lisps Igor the flesh golem from behind the counter. "I thee you are interethted in our uthed itemth. Thome of them ARE thecond hand, young mathter, if you'll ecthcuthe the pun, and of courthe they have all been tethted on animalth, or in animalth, or both." Next to the bits of dismembered bodies, are shelves holding pots and bottles holding poisons, potions, oils and dusts of various sorts. Opposite these the young man spots a bookcase filled with heavy tomes. "The library sir? Yes, we currently have copies of 'Ghost', 'The Wraith', The Mummy', 'Interview with the Vampire', 'Night of the Living Dead', 'Dead Man Walking', 'Wanted: Dead or Undead', 'Undeath Becomes Her', 'The Liches of Eastwick', 'Calendar Ghouls', 'Undeath Wish' volumes I - V, 'The Uninvited Ghast', 'Single Wight Female', 'Undead Poets Society', and the current necromantic bestseller: 'How to Make Friends and Influence People'." "Oopth, I forgot to lithp there. Thorry thir!" "How much is this poison? ", says the necromancer struggling to remove a bottle from the shelf. "Pleathe don't touch that, thir! ", shouts Igor, but it's too late. Something emits a sharp click, and slowly the entire wall begins to move, silently opening to reveal the secret entrance leading straight to the undertakers next door! Had the young man been allowed to climb the stairs, he would have seen some of the ill-gotten gains stored there by the two villains - chests filled with gold and gems, and a magical mirror. Strangely the windows have been plastered over, excluding the sunlight. At the other end of the room stands a huge four-poster bed, where Mr. Burke likes to fetch his latest conquests for a quick bite. Mr. Hare, of course, sleeps in one of the coffins next door, and Igor never sleeps. 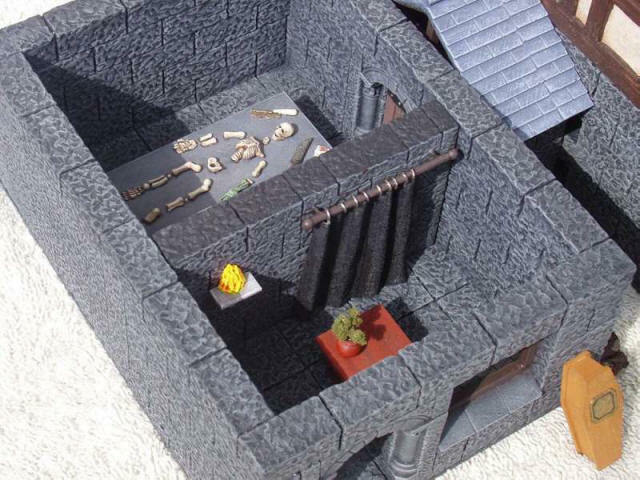 The buildings were designed to be somewhat modular, and allow for different arrangements - this one shows how the storeroom becomes a porch. Another arrangement, with a single-storey half-timbered cottage next to a three-storey stone townhouse. To make the buildings more flexible, the signs were fitted by attaching clear plastic to the back. This fits in the gap where the buildings come apart. It also makes it far less likely that they will get broken off. Where would they buy their stuff in a Lawful Evil market town? This model is one possibility.